Two-man metal band BOMB AND SCARY, which features in its ranks members of IMAGIKA and DR. CHUNK, has just released its new album on Sleaszy Rider Records. The group's musical direction is described as "thrash, industrial and metal all rolled into one. BUT, new and interesting to say the least." 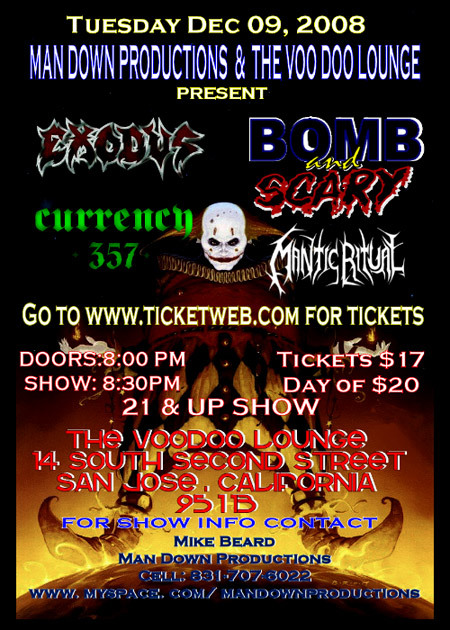 BOMB AND SCARY will open for thrash metal veterans EXODUS on December 9 at the Voodoo Lounge in San Jose, California. For more information, visit www.myspace.com/bombandscary.